In 1967, three years before completing Spiral Jetty at the edge of the Great Salt Lake, Robert Smithson boarded a bus in New York City and returned to Passaic, New Jersey, the city of his birth, to take a walking tour of the “monuments.” The monuments that Smithson discovered include such things as a steel bridge with wooden sidewalks, some pontoons, a pumping derrick, some above-ground piping, a parking lot, and a children’s sandbox. This mock epic expedition was documented, appropriately, with a cheap Instamatic 400 camera. I had never thought of Smithson’s art in the same context as W.G. Sebald’s writings before, but the related essay that Smithson wrote, recently reprinted in the anthology Ruins, was a real jolt. Smithson’s interest in industrial detritus and obsolete structures is directly tied to a vision of history that is not unlike Sebald’s. He was writing on “Themes and the Usual Variations.” I looked at a blurry reproduction of Samuel F.B. Morse’s Allegorical Landscape at the top of Canaday’s column; the sky was a subtle newsprint grey, and the clouds resembled sensitive stains of sweat reminiscent of a famous Yugoslav watercolorist whose name I have forgotten. A little statue with right arm held high faced a pond (or was it the sea?). “Gothic” buildings in the allegory had a faded look, while an unnecessary tree (or was it a cloud of smoke?) seemed to puff up on the left side of the landscape. Standing on banks of the Passaic River, next to the first “monument” – the steel and wooden bridge – Smithson watches a bridge keeper turn the bridge sideways to permit a barge to move past. That zero panorama seemed to contain ruins in reverse, that is – all the new construction that would eventually be built. This is the opposite of the “romantic ruin” because the buildings don’t fall into ruin after they are built but rather rise into ruin before they are built. This anti-romantic mise-en-scène suggests the discredited idea of time and many other “out of date” things. And here’s Smithson walking through a large parking lot in the center of downtown Passaic. Finally, here is Smithson being most Sebald-like as he writes about the monument of the sandbox. The last monument was a sand box or a model desert. Under the dead light of the Passaic afternoon the desert became a map of infinite disintegration and forgetfulness. This monument of minute particles blazed under a bleakly glowing sun, and suggested the sullen dissolution of entire continents, the drying up of oceans – no longer were there green forests and high mountains – all that existed were millions of grains of sand, a vast deposit of bones and stones pulverized into dust. Every grain of sand was a dead metaphor that equaled timelessness, and to decipher such metaphors would take one through the false mirror of eternity. The sand box somehow doubled as an open grave – a grave that children cheerfully play in. Smithson’s journey to his hometown resulted in an artwork consisting of six photographs and a photostat map, now in the collection of the Museet for Samtiskunst in Oslo, Norway. Smithson also published an essay in Artforum that same year, using the same images as illustrations. 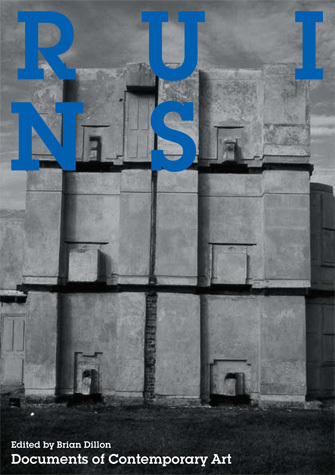 Ruins (2011), edited by Brian Dillon, is part of the Documents of Contemporary Art series published by Whitechapel Gallery and MIT Press. Not unsurprisingly, Sebald crops up in a number of the essays.